Available for $42 at Sephora, Ulta, and Anastasia Beverly Hills website. Save 4% cashback for shopping at Sephora here. Save 3% cashback for shopping at Ulta here. 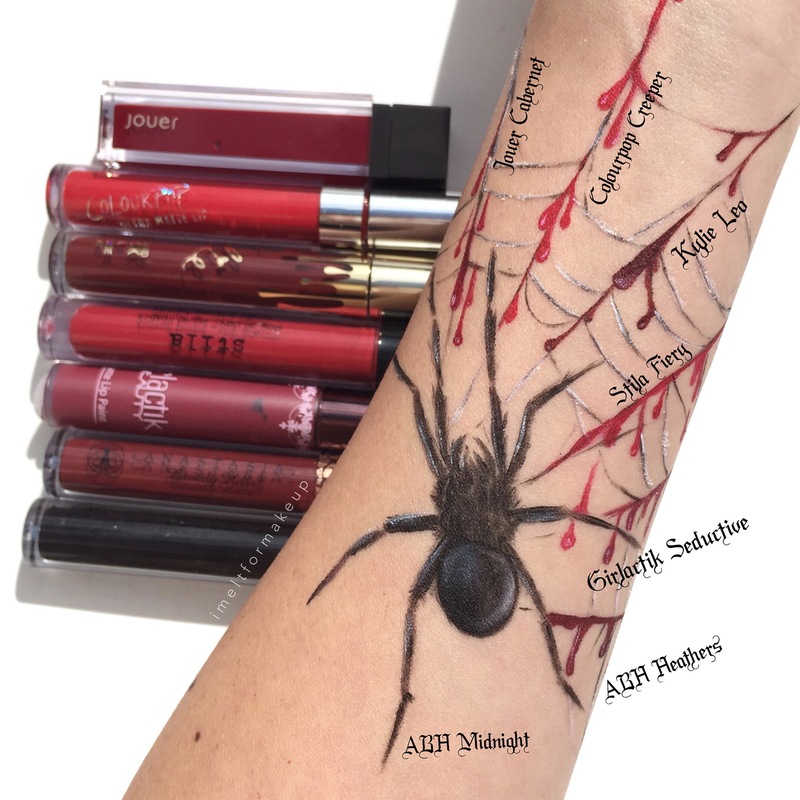 Happy Halloween Liquid Lipstick Swatches! Hope you all have a safe and “sweet” Halloween! Slowly I was able to get the newest colors when they came back in stock. The most recent ABH liquid lipstick purchase was Midnight (Black,. Paint the Royal Blue was also $10 but I did not get that one). It was on sale at Macy’s, they were running a Black Friday promotion in July and it was only $10 with free shipping, I could not pass the deal. When swatched on my arm the black is nice and even, but if you rubbed it will slightly come off. Most good liquid lipsticks when swatched on my arm do not budge, as I wear it all day till bed time. I don’t worry about it smearing all over the place and keep it as a temporary arm tattoo for the day. Prior to getting Midnight I got the color Ashton. Of course, I got lured in with all the social media pictures on Instagram. Ashton is a pretty warm terracota color when first applied, after an hour or so it turned into a reddish dark bricky color. I wanted it to look like how it looks when first applied. 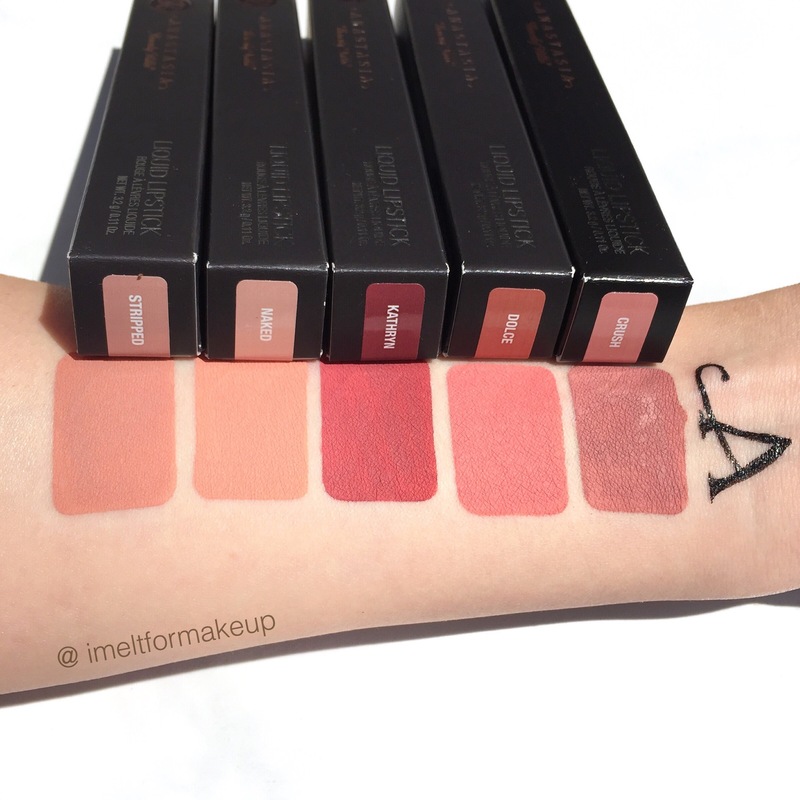 With most of the Anastasia Liquid Lipsticks pictured, they make my lips look wrinkly and feel dry. Kathryn also got a little darker with wear but did stay on my lips almost all day with no wear, but it looked a little dry and shriveled. I was swayed away from buying their Liquid Lipsticks 2 years ago after I had Electric Coral and Craft crumble, crust, and crack on my lips. This time I thought I give it try again because Norvina said they are reformulated, and supposedly even a 3rd reformulation. Anyways I rarely reach for the Anastasia liquid lipsticks, maybe because there are other colors and brands that complement my skin and comfortably long-wear. The gold outline is Molly Cosmetics in 24K Liquid Lipstick. The gold is amazingly vibrant, but if touched or wiped it starts to crust off. On the lips it is the same, if I keep talking it just kinda flakes off and loses its Metallic look. 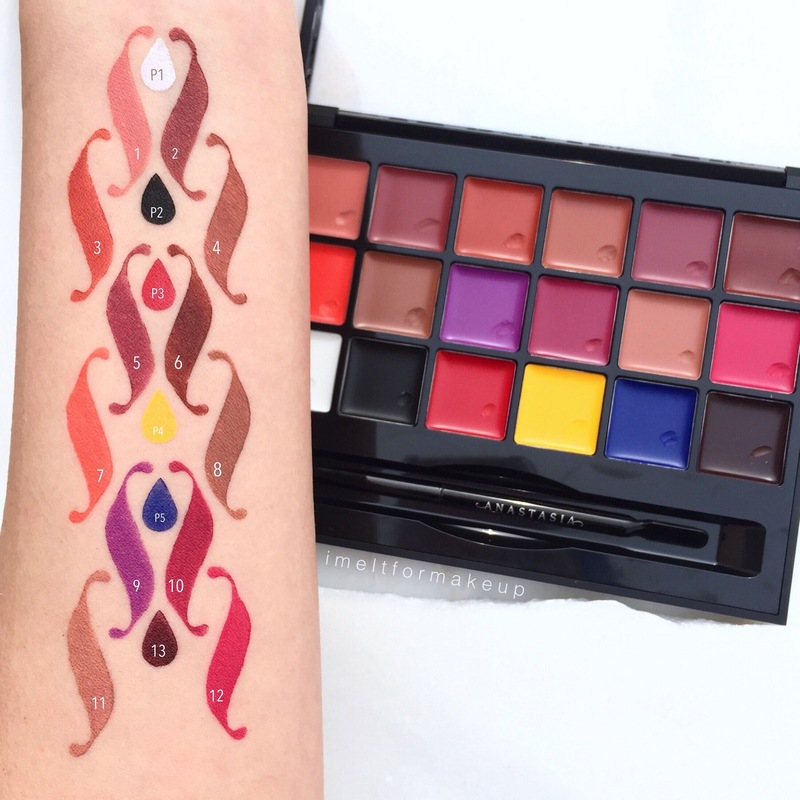 It is a fun liquid lipstick to use for costume parties, halloween, lip art etc. You know me I am always trying to swatch makeup in different cute ways. 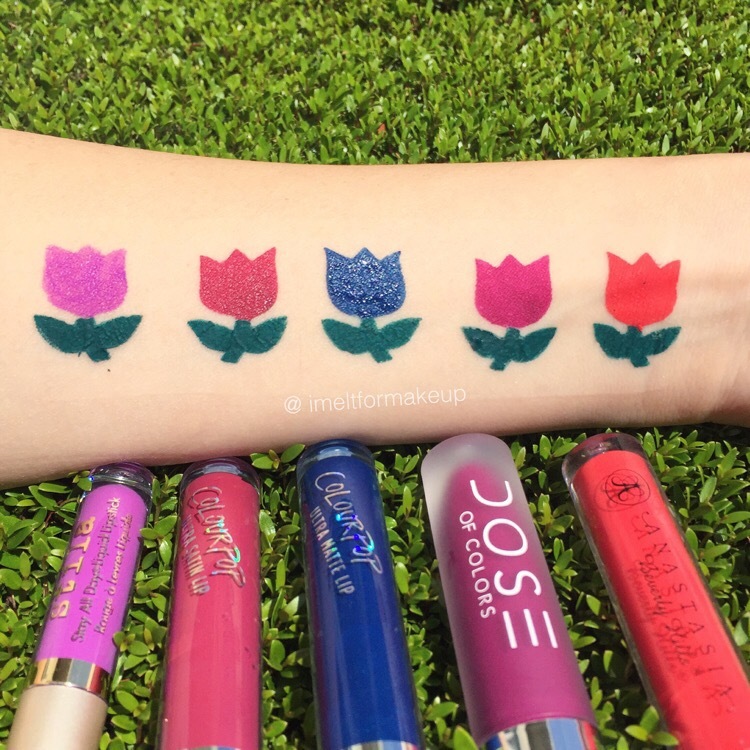 Enjoy my little flower swatches with mini reviews of each below. Stila – Como ($24) : Stay all day liquid lipstick is neon magenta/hot purple look when on the lips. It’s comfortable and buildable. 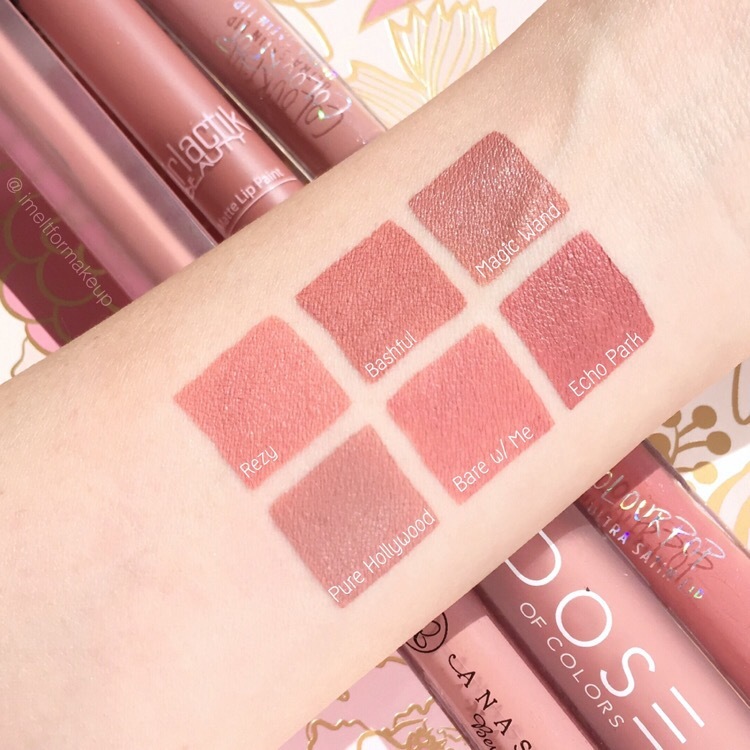 Colourpop – Lyin’ King ($6) : Ultra satin liquid lipstick that is long wear but not transfer proof. It’s all vegan and cruelty free. I would say this color looks like a red berry on me. Colourpop – Jellies ($6) : Ultra Matte liquid lipstick is a little hard to apply because it’s a bit drying. Fun and affordable color for halloween costume looks etc. 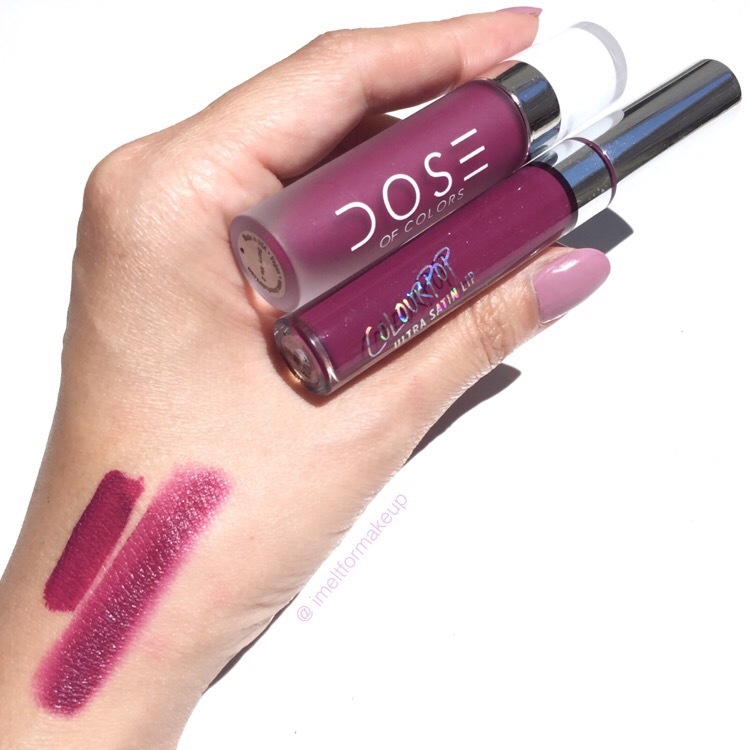 Dose of Colors – Berry Me 2 ($18) : Liquid-matte lipstick is a pretty berry color, it really brightens and complements my NC15-NC25 skin. Sometimes I find the applicator a little hard to maneuver to get the clean edges. I have not worn it all day but it is comfortable. A nice dupe is the colourpop panda ultra satin, apply and blot off excess and it looks exactly the same. See picture below.